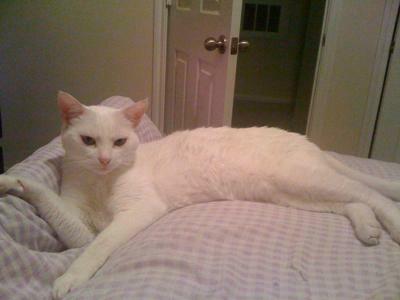 I went to the pound one day to adopt a beautiful white cat I had seen online. As I wrote in Merlin's story, when I arrived, I found this small no-kill shelter trying desperately to save animals they had just found out about and begged me to take Sophie and two solid white baby brothers at a discount. I couldn't say no. I took home Sophie, Merlin and his brother, who went to live with my daughter and is now known as Yuki. Unfortunately, Sophie is too timid with other cats and they know it, so they pick on her all the time. We built her a beautiful area in my office so she had a choice of window seats and her own safe territory. But she became sick, and we almost lost her. After many rounds of meds and vet visits, she began to get better. My daughter would take her out and let her walk around in the back yard while she followed her, making sure she didn't go over the fence and get hit by a car. She really improved then. So we knew she didn't like her beautiful prison, and we couldn't let the other cats keep terrorizing her. My daughter took her to live with her and her new husband, and she was happy. However, an old kitty that grew up with my daughter was pining for her, and she ended up taking her home too. Now Sophie has banished herself to the garage and we are working hard to find a home with no other kitties. She is fine with dogs and kids. She is a diva and a very gentle soul. Above is a picture of her with a friend that tried to adopt her, but later learned that her apartments would not allow it. I appreciate the thoughts and kind words. She did not suffer long, other than the fact that we kept forcing medicine down her that she fought so hard. We didn't want to give up. I've heard that somehow animals know these things. But us crazy humans, we can't stop fighting until the end. She ended up pampered and loved in the bedroom with my daughter's roommate until the end. She was happy and content in there. Claudia, thank you for creating and maintaining this beautiful website. It is so nice to talk to others about our beautiful and much loved babies, and have an opportunity to read about other's loved ones. It starts my day almost every morning. I am so sorry to hear about Sophie's passing. I am truly heartbroken. Sophie was such a beautiful and precious cat. My thoughts are with you and your family. I know how it feels to lose a beloved pet. What helps me get through the toughest of moments is to remember the wonderful times we shared together. I'm sad to report that we lost our 3 year old Sophie yesterday. From the time we adopted her, and she was given a clean bill of health from their vet, Sophie has struggled to stay healthy. After several hundred dollars and 3 vets, we were still losing her. We were told yesterday that it is probably feline leukemia, which she must have had at the time of adoption, and treatment would not work anymore. She refused to eat or drink and was dying slowly. I am still trying to wrap my mind around it and wonder how so many vets couldn't see it sooner. Sophie, we started missing you the minute we relinquished you to the vet and always will. I know your suffering has ended, but ours will continue for some time. We will think of you every time we look at our other 2 white, green-eyed friends that look so much like you. Sophie is so beautiful. I hope you find a home for her so that she can be the queen. Some cats are shy like that. One of my friends has a very shy cat, too. She only interacts with my friend and her husband. She barely tolerates me. She lets me pet her once or twice but then she goes and hides. I still love her though. Thank you for sharing Sophie's picture. She is divine! Note to our readers: Here's Merlin's story, also submitted by Kim.